On August 30, 1986, a secret meeting took place in Paris between Amiram Nir, the counterterrorism advisor to the Israeli prime minister, and Dr. Hassan Rohani, then deputy head of Iranian parliament and the secretary of the country's national security committee. Eight years later, Yedioth Ahronoth military pundit Ron Ben Yishai published the transcript of the conversation, which has suddenly grown in relevance in view of Rohani's election to Iranian presidency. It sees the president-elect a canny politician willing to tell everyone just what they want to hear to achieve his goals. What follows is the full piece from 1994. Dr. Hassan Rohani is a very canny, clever man. Otherwise it's impossible to comprehend how he got where he did without being a cleric. He's the general secretary of the Higher Committee for Iran's National Security, and deputy Head of Parliament. He is among the very few whose standing actually improved since Ayatollah Khomeini seized power in 1979. Very few outside Iran know anything about him. He is careful to remain behind the scenes, and shuns the press as if it were a disease. Yet when Iran President Akbar Hashemi Rafsanjani needs someone to carry out a sensitive diplomatic mission or fix an urgent security issue, Rohani is his man. Of late Rohani has been in charge of the revival of the "strategic partnership" with Syria, which has deteriorated because of Hafez Assad's rift with Hezbollah. Syria, engaged in a concerted effort to see its name taken off Washington's blacklist of states that support terror, is going tough on the operatives of Hezbollah, Iran's key ally, at Lebanon's Beqaa Valley. Iran, worried about the firmness of its hold over Lebanon, came to Hezbollah's assistance and sent Rohani on a mission to Damascus. He met with Assad and delivered to him personal communications from the Iranian leadership, including an invitation to visit Tehran. At that time he also met with top Hezbollah officials and Palestinian resistance groups, to cheer their spirits. He promised them Iran would not desert them and keep giving them assistance and funding so they accelerate their terrorist warfare against Israel. At first glance there's nothing out of the ordinary here. Yet the report about the visit of the Iranian envoy, a report that grabbed headlines in Syrian and Lebanese press about a month ago, reminded me of a tiny tape which I had the opportunity to listen to and transcribe. The soloist is none other than Rohani himself, yet he's singing a totally different tune: "The Ayatollahs and the Revolutionary Guards sent about $3 million to Lebanon, while we in Iran barely have money for the most urgent sustenance and security needs. They gathered all the Lebanese mullahs and promised them to turn Lebanon into an Islamic republic. What nonsense! I tried to put an end to this but failed." These words of sacrilege were uttered by Rohani about eight years ago, on August 30, 1986, in a meeting between him and the late Amiram Nir, who then was the counterterrorism advisor to the Israeli prime minister. The fact of the meeting was never reported. Present at the meeting at a Parisian hotel, together with Nir and Rohani, was one Manucher Ghorbanifar, a prominent Iranian arms dealer living in Europe. Ghorbanifar's record included brokering a few weapons-for-hostages deals involving Israel and the US; the most high-profile of those was the Iran–Contra Affair, or Irangate, which saw accusations that the Reagan Administration secretly facilitated the sale of arms to Iran – the subject of an arms embargo under the US Arms Export Control Act (AECA). Ghorbanifar had excellent contacts with the Iranian leadership and had no trouble organizing a secret gathering at Nir's request. These were the days when the US-Israel-Iran triangle reached a deadlock and the Americans lost faith in Ghorbanifar and were looking for alternative contacts for talks with the Ayatollahs. Yet the wily Ghorbanifar was no quitter: he knew Nir's interest in the Irangate case had less to do with his desire to set American prisoner free, but rather lay in the strategic aspect. Nir was a firm believer in reinstating the strategic ties between the US, Israel and Iran and to reverse things to how they were during the Shah rule. In order to achieve that he knew he must assist Iranian moderates establish a strong underground, which will eventually overthrow the rule of the Ayatollahs. Ghorbanifar knew about Rohani then what most still don't know about him to this day. Because of that, and to prove his own worth as a broker, he proposed to arrange a meeting between the two. Rohani was then the Iranian deputy chair of parliament, and Rafsanjani's right hand man; he came to Paris as the head of a diplomatic delegation. Yet at Ghorbanifar's request he remained in Paris for a few additional days to meet Nir. There was never a great risk from the Israeli perspective, as Ghorbanifar never told the Iranians Nir was Israeli. Rohani was told he was a White House national security official. He was also made to believe that "boss" Rafsanjani approved of the rendezvous with "the American official," hoping that a rapprochement with the US would spell renewal of weapons supplies, of which Iran, amid armed conflict with neighboring Iraq, was badly in need. Nir came to the meeting equipped not only with an American identity, but with a microtape for recording the conversation. Ghorbanifar opened the meeting, saying in English "I explained to Dr. Rohani that you're from the White House, a special envoy to the Middle East, and he's happy to meet you." Nir said "please tell Dr. Rohani I greatly appreciate his willingness to prolong his stay at Paris to serve the interests of both sides. I thank him, both in my name and in the names of my superiors, for his positions and his largeness of spirit." Rohani: "I understand English, yet unfortunately can't speak it. Thus Ghorbanifar will translate what I say. Please, treat this meeting as a private matter. Very private. I'm not speaking for my government. This convention is against all logic. Yet, because I believe in Ghorbanifar, I agreed to meet with you. I hope it will help. "I feel very uncomfortable over Imam Khomeini's extremist speech yesterday," Rohani added, "I think it was his most hard-line speech since he seized power. He demanded to break and cut into pieces all those who don't hold with his extremist anti-American stance, but it's your fault: you Americans sit and watch what goes on between us and Iraq and do nothing to help us. You won't get a thing from Iran until you start moving about and supply us what we need." At this point, however, Rohani admitted: "It should be clear to you that what I said now is what Rafsanjani demands I say. If I will not do so, it will be the end of me. Of late, we're led by extremists such as Khomeini and his son. I'm surrounded by guards. I want nothing to myself, least of all money, as I can't spend it in my position: it would draw suspicion. I'm seeking what's best for my country. You should know who you are dealing with." "If you analyze Khomeini's character you'll see that a strong opponent makes him go 100 feet back; while a weak one impels him to drive forward. Unfortunately, you've taken the wrong stance: you are too soft on him. Had you been tougher, you'd be in a position of superiority. You didn't show power." All the moderates in my country are walking a thin line. We can't meet with you every week. Not even every month. We are ready for a real cooperation with you, but first you'll have to help us nurture the true Islam in our country, and for that we need your money and assistance to finish the war with Iraq." Nir: I thank you for your honesty. No one will learn of this conversation. Only two persons in my country know about it. Yet you should know that we come with an open mind and an open heart to all concerns Iran. We shouldn't delve on past mistakes, yours or ours. We must look forward. It's clear Iran has no future unless it reconnects with the West. Just as it's clear we are intensely invested in the Iranian issue. We have great respect for the Iranian people. We have great respect for the Iranian revolution. But we wish to help you, the moderates, to help yourselves. Tell me what you think is necessary and I'll see what we can do." 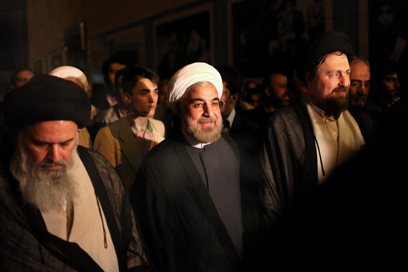 "First and foremost you should stand strong against Khomeini; maintain a hard line," Rohani said. Nir: "Lebanon, for instance, is one front where we'll try to stymie Khomeini's line. We'll do it immediately. Rohani: "This is good. The Ayatollahs and the Revolutionary Guards sent about $3 million to Lebanon, while we in Iran barely have money for the most urgent sustenance and security needs. They gathered all the Lebanese mullahs and promised them to turn Lebanon into an Islamic republic. What nonsense! I tried to stop this but couldn't. Unless you show your teeth against Khomeini you'll have trouble all over the world. If you threaten him with your military might he'll kiss your hand and run away." Nir: "Where should we display our power?" Rohani: "If, for instance, you tell him 'You must release all the war prisoners in Lebanon within five days. Should you fail to do so, we'll launch a military strike against you and you'll shoulder the blame.'" Nir: "We're an empire. At times, we're slow. But you've seen how we acted in Libya. But we believe that use of force would drive Iran into the hands of the Russians." Rohani: "You should resort to Muslim propaganda against Khomeini through Pakistan and Turkey." (As the US is doing today). At this point Nir announces he's going to the bathroom. He flips the tape in the recording device and returns to the room. The conversation turns to issues of regional strategy; it is clear Nir and Rohani have found a common language. As the meeting approached close, Nir inquired "how can we help those in Iran who believe its future lies in an alliance with the West?" Rohani: "You could write a book on the subject. But the best way would be that I return to Iran and speak with people close to Ayatollah Montazeri. We'll work out a plan and I'll return to you with an answer. But I want to know you're serious. I don't believe you really want to help us. While Khomeini and his people are strong there will be no rapprochement with the West." This is where the cat got out of the bag. At that time Ayatollah Montazeri was the main candidate to inherit the mantle of the terminally ill Khomeini. He was the architect of the contacts with Israel and the US. Rohani apparently tried to help Montazeri in the power struggles that were, and still are, taking place within Iranian leadership. Yet none of Rohani's plans came to fruition, as the Irangate scandal broke out, which put an end to Montazeri's ambitions and Rohani's efforts to promote him. After Khomeini's death the Ayatollahs appointed extremist Ali Khamenei – who rules the country to this very day – as his successor. Amiram Nir quit his post after the Irangate scandal, and took a career turn toward business. He was killed in 1988 in a helicopter accident in Mexico, and some claimed he paid with his life for knowing too much about the involvement of George Bush Sr. in the weapons scandal. See all talkbacks "Rohani in 1986: West too soft on Khomeini"